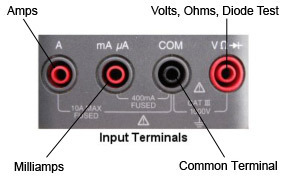 Some DMMs have only one port for Amps, while some have milliamp ports and Amp (shown below). 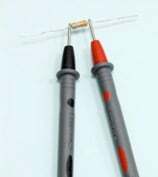 The milliamps port is used for measuring currents less than 300 mA (typical) for a more exact reading. 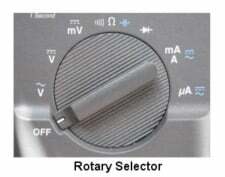 The rotary selector, shown here above is used to select the type of measurement you wish to perform. The "V" with the wavy line above it is for measuring AC voltage. The "V" with the dotted and solid lines above it is for measuring DC voltage. The "mV" with the dotted and solid lines above it is for measuring DC milli-volts. The "Ω" position is for measuring resistance. The next position has a "diode" symbol. This position allows us to test diodes. The "mA/A" position is for measuring milliamp's and Amps. The last position, "µA" is for measuring micro-amps. The best way to understanding how to use a DMM is by making some simple measurements. 1. Plug the black jack into the COM port on multimeter and the red jack into the Voltage port (often indicated as VΩmA). 3. 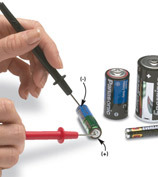 Place the red probe to the "+" and the black probe to the "-" pole on the battery. Note: When measuring resistance, it's usually required to measure the component outside the circuit, as shown below, and not in the circuit. 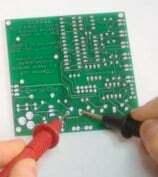 Taking measurements in-circuit introduces the risk of inaccuracy due to resistance from neighboring components. Measuring current is a little different than simply placing the probe on a contact as with voltage. First plug the red jack into the Amp port (usually marked with the letter A). To measure current it's required to loop the meter into the circuit, as shown in the image below. The circuit is opened and the probes are inserted within the closed circuit so the current runs through the meter completing the loop. Another, and possibly more accurate, technique is to measure the voltage across a resistor and use Ohm's law (V=IR) to calculate the current. There are two basic types of multimeters - analog and digital. Analog multimeters are still commonly used and cost about the same as a digital multimeter (DMM) but do not provide the same accuracy as a DMM. Analog meters are useful in displaying real-time readings with voltage and current drops, where it is necessary to constantly observe the effects of adjusting parts of the circuit such as the load. Analog meters' distinguishing feature is a display with a spring-loaded needle pointer resting on a wire coil which is surrounded by a magnet. With the flow of current, it produces a force that pushes the magnet to twist the coil causing its rotation. Digital multimeters are more commonly used because of its accuracy and ease of use. Unlike analog meters, DMMs have no form of resistance within, offering a precise reading. It is also not limited in terms of the size of a readout dial. DMMs can be easily calibrated and have an automatic range adjustment. DMMs can also be directly connected to a computer by IrDA links, RS-232 connections, USB, or an instrument bus such as IEEE-488. The interface allows the computer to record measurements as they are made. What to look for in a basic multimeter? battery indicator appears. Also, keep your fingers behind the finger guards on the test probes when making measurements. correct position, and never use a meter where the leads have been damaged. In addition to the essential hand-held multimeter, for a full service workshop, your projects may eventually take you to benchtop test stations like the ones shown below. Understanding that cost is a major issue when building a workspace, Jameco has multiple labs-in-one. With multiple instruments packed into one piece of equipment, these lab centers can go a long way in your testing procedures.